This latest video from Art In Wax show me painting in hot wax some summer flowers. The flowers are based on a clematis style flower, we have many clematis coming into flower in our garden at the moment. Clematis come in many shapes and sizes and wonderful colours, we have three varieties ourselves with the small compact pink blooms coming early in May to larger white and a purple variety blooming as the summer progresses. The flowers I have painted here are “in the style of” a clematis, with so many types to choose from this is my own interpretation, as with many of my paintings I consider the subject to be an impression of. 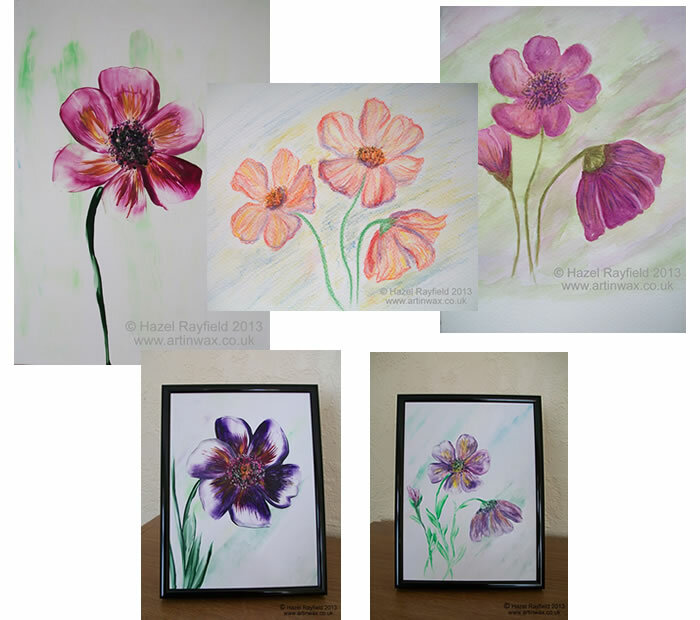 The film shows how the flower is painting in hot wax, and gives reference to the watercolour I painted a few days ago. I have recently rekindled my fondness for watercolors and using them in parallel with the wax is great fun. The pictures below show what I’ve been working on in this subject. The watercolour I used as a reference in the video below is the pink one on the right and the center picture is done using watercolour pencils, which I find great to sketch with, the framed paintings are both Encaustic paintings and approximatley A5 in size and are for sale, contact me for details and availability. If you have enjoyed seeing this demonstration please leave me a comment or perhaps share a link to this page on twitter or facebook. We have just uploaded a new demonstration video to the Art In Wax You Tube Channel. The channel has been open since January this year when Adrian and I produced our first short film of me painting a Rose in hot wax and has had lots of views and interest. The channel now has five films of me painting in Encaustic wax. The latest film demonstration is a candle painting. With the festive season approaching I thought it would be fun to create a short film of this subject as it would make a fun little Christmas card. 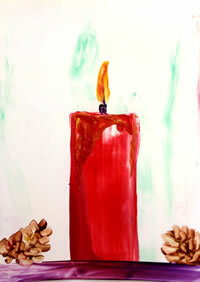 The painting is an A6 size, on gloss card using red and gold wax to create the candle giving it a shine, then purple and yellow wax for the base and the candle wick and flame, together with some gold wax for highlight on the dripping wax that runs down the candle giving it a realistic look of flowing wax. We have great fun creating these short movies, the outtakes (now in the recycle bin!) while making this one in particular film were very funny as once I got the giggles it was hard to concentrate on the wax ….. so we had to have a few takes with this one! More You Tube demonstrations are planned soon, showing some more techniques and how I like to paint in Encaustic. The painting shown here with the pine cones is another picture created while filming, this was one from the outtakes ……..
Christmas Card – last year we used one of my artworks to create our Christmas card, view that picture on the Christmas Candle blog post from last year. Why not subscribe to the Art In Wax Channel to be first to see the latest uploads. If you enjoyed this demonstration and would like to leave me a comment or have a suggestion of another subject you would like me to show that would be great. I have been painting a lot of Roses lately, we have recently created two video films of me painting pink roses in encaustic wax they are currently online at youtube which can be view via the Art In Wax You Tube Channel. Video One : Painting a single stem pink rose, including demonstrating how I create a light coloured background then paint a single stem rose using the encaustic iron. Video Two : This video demonstration takes a look in more detail, giving a closer view of me painting a rose with rose buds and a leafy stem, it also show more detailing using the encaustic stylus. Flowers are a wonderful way to celebrate Valentines Day and giving a gift of flowers in Art gives pleasure that lasts. Encaustic Paintings, my artwork is created using encaustic wax, the finished paintings have a texture and wonderful sheen, they can be displayed framed or not (if they are to be framed they should be mounted so that the wax doesn’t touch the glass), I also like to display the smaller pieces on small display easels, I get many comments from people who once they see the paintings in real life say how the online pictures don’t capture the sense of sheen and texture as they really are. 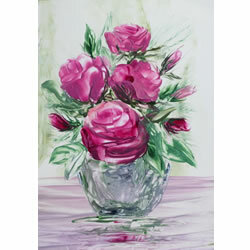 The Art In Wax online shop now has this brand new Rose painting for sale, this painting features a vase of beautiful pink roses in a silver vase and can purchased online direct from me the artist. Please visit the shop page for details. Another recent Rose painting is also online for sale via one of my outlet stores at Etsy.com/artinwax.